To normal thinking people, gun control doesn't make a whole lot of sense... especially the kind of gun control that seeks to dictate how many bullets can legally be carried in a single magazine. As this image humorously illustrates, it's that one last bullet that makes a gun "dangerous." 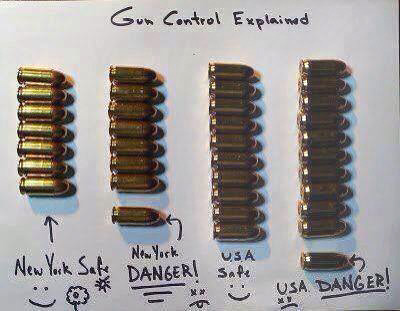 For example, in New York, 7 bullets is considered "safe' -- but 8 bullets is "dangerous." In the United States (varies by state, of course), 10 bullets is considered "safe" -- but 11 bullets is "dangerous." Does one bullet more or less in a magazine really make a gun more or less dangerous? Are large capacity magazines (LCMs) really a bigger threat than a guy carrying two smaller magazines? This pictorial way of assessing restrictions does rather make a point! 'Magazine control' of course is for the most part just another attempt at 'gun control'. ©: 2015 JPFO All rights reserved.